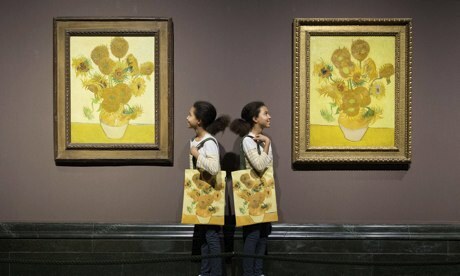 Identical twins pose in front of the sunflowers at the National – Photograph: Leon Neal/AFP/Getty Images. 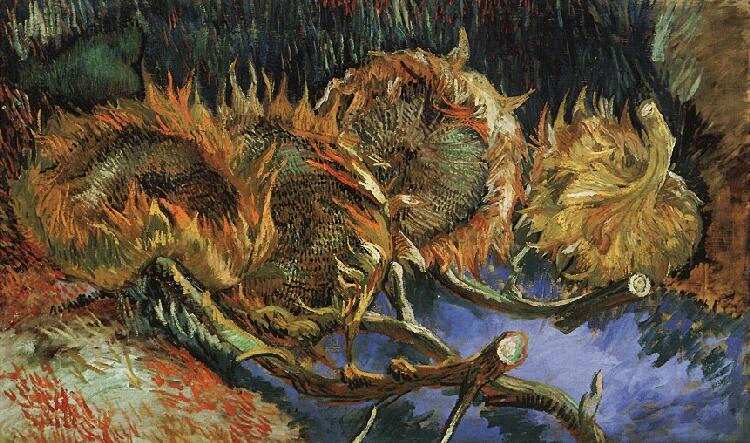 Two of the most famous plant paintings of all time are currently hanging next to each other in the National Gallery. 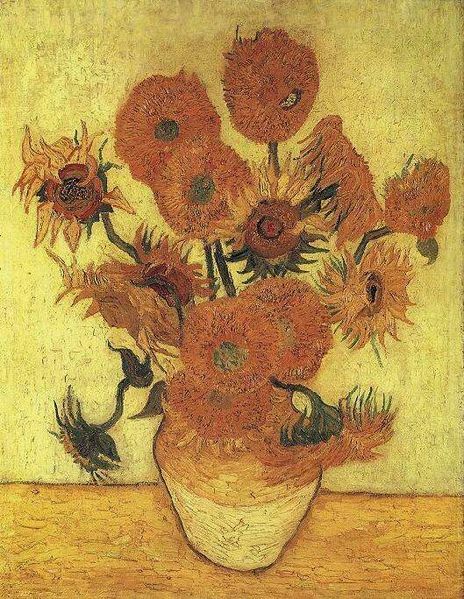 Whether you are seduced by their charms or not, this reunion of two versions of one of Vincent van Gogh’s Sunflower paintings for direct comparison, has not been possible in London for 65 years, making it a rare event that any plant art appreciator should consider witnessing. 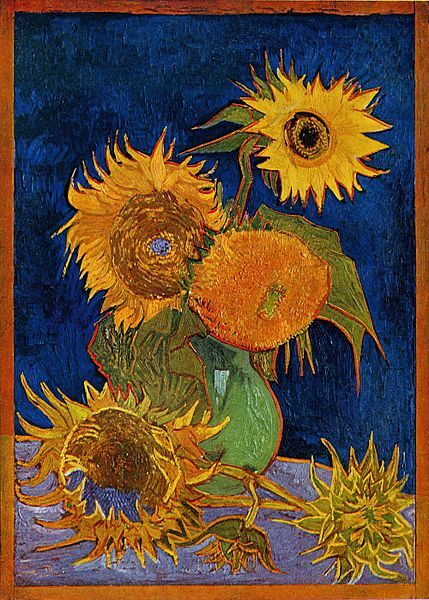 The story goes that Van Gogh painted two series of Sunflowers, or as they were originally called, Tournesols (sunflowers in french!). 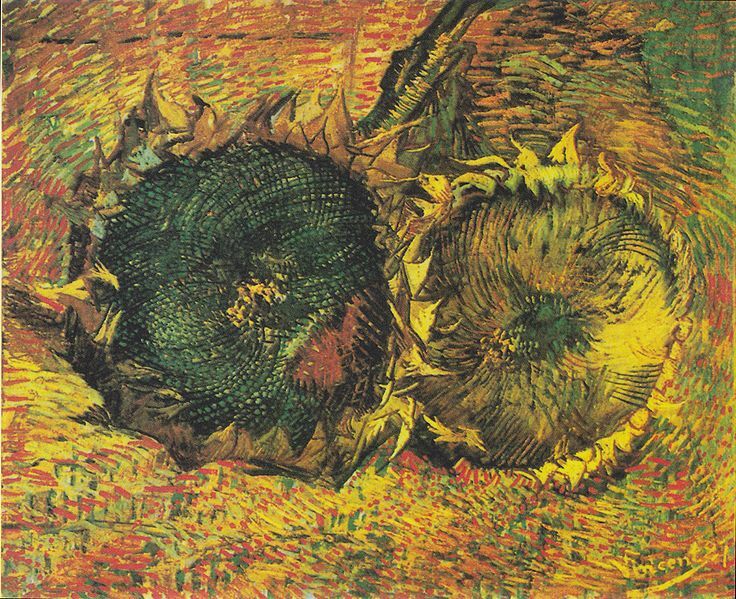 In the first series (see below) the sunflowers were strewn on the ground, whereas in the second they were elevated to pots. 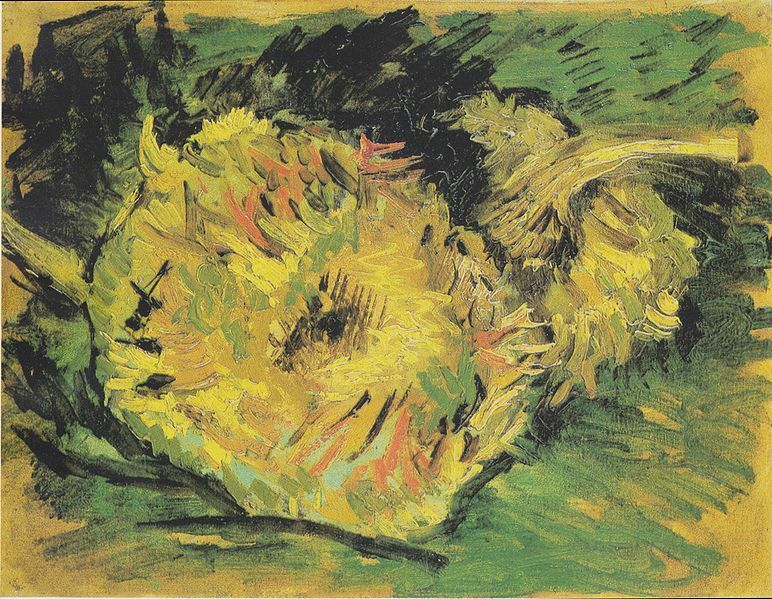 In the pot series Van Gogh painted an initial four, he then later followed those pieces by a further three copies (of two of the original four) in early 1889 – so seven in total. Only three remain of the first four, as one was destroyed in Japan in the Second World War. Of the other three, one is located permanently at the National, another held in the Neue Pinakothek art museum in Munich, and the other vanished into a private collection and has not been seen for decades. 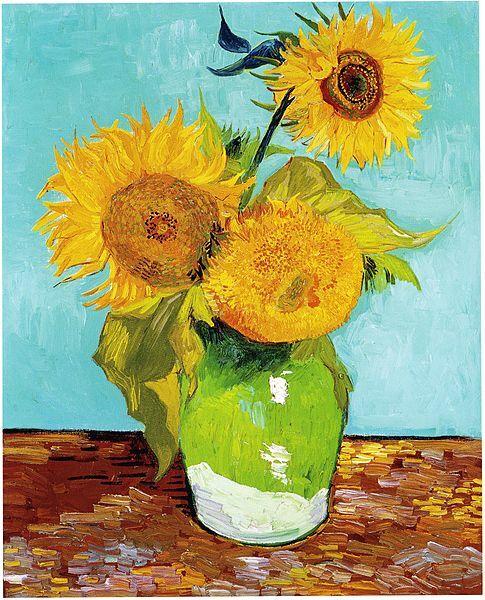 The three replicas are all held publicly in the Philadelphia Museum of Art, the Sompo Japan Museum of Art, Tokyo and the Van Gogh Museum, Amsterdam respectively. It is the dutch owned painting that is currently loaned to the National for the exhibition period. As one is a copy of the other, it warrants probably the most memorable spot the difference exercise of all time. The colours in the Amsterdam version are more stylised, less botanically correct than the original, and some argue, more interesting. So many differences can be noted and evaluated with the convenience of close proximity. The National Gallery is worth a visit at anytime. It is so easy to forget all what is housed there. Walking through the rooms you get hit with masterpiece after masterpiece, famous artist after famous artist. It is quite overwhelming. 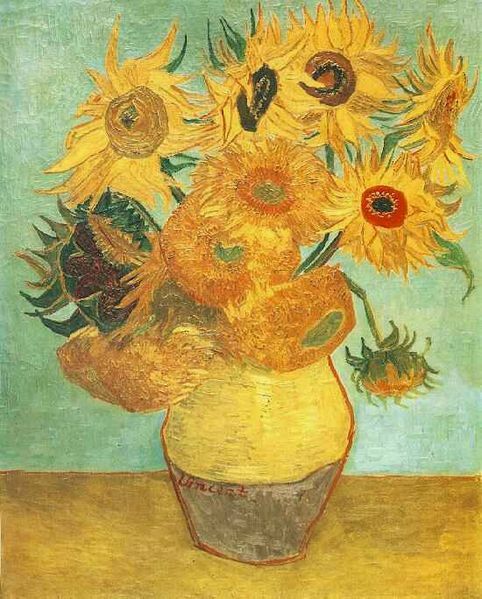 Sometimes it is hard to believe that these culturally iconic artworks are actually right there in front of you and none more so than The Sunflowers. Plant Curator doesn’t need persuading of their value – finding them golden, auroral and botanically interesting. Stirring stuff indeed. 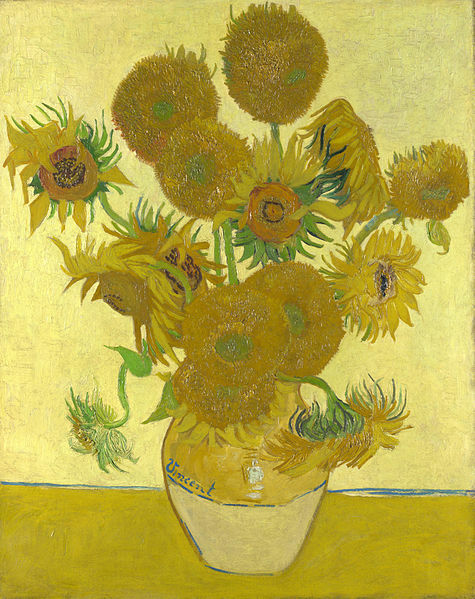 The Sunflowers is showing at the National Gallery, London from 25 January to 27 April 2014. Below are the 4 originals (in order below – privately held**, destroyed*, Munich, National), followed by the 3 copies (Philadelphia, Amsterdam, Japan). 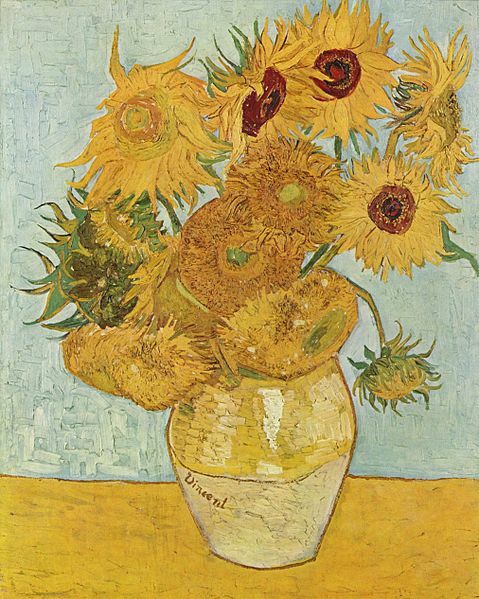 * A recent book by Martin Bailey (Van Gogh expert extraordinaire) The Sunflowers are Mine: The Story of Van Gogh’s Masterpiece , revealed new information about the destroyed painting – uncovering a previously unknown print. **He also tracked down the privately held artwork by following the trail of its passing through private hands to the current, unfriendly owner. 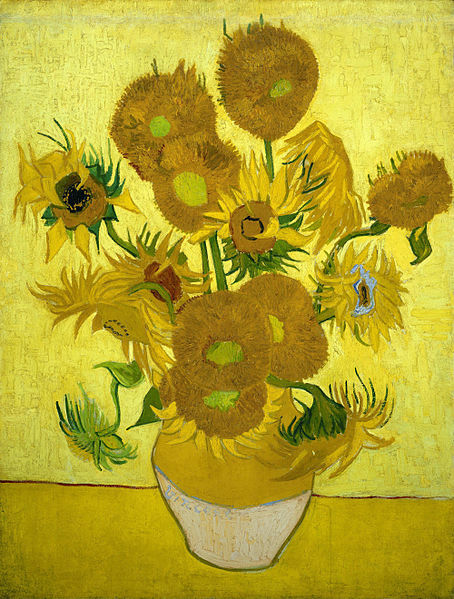 The first series painted between 1888 and 1888. 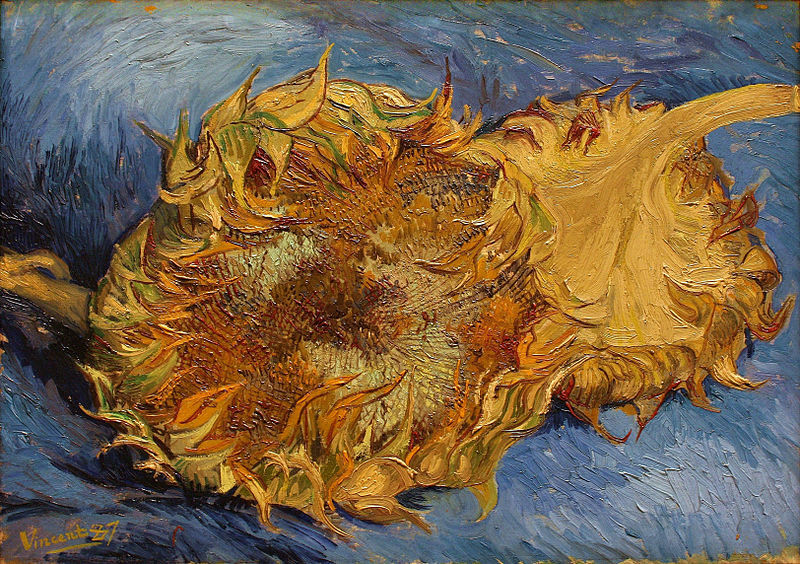 Held in Van Gogh Museum, Amsterdam, Metropolitan Museum of Art, New York, Kunstmuseum Bern and Kröller-Müller Museum, Otterlo.